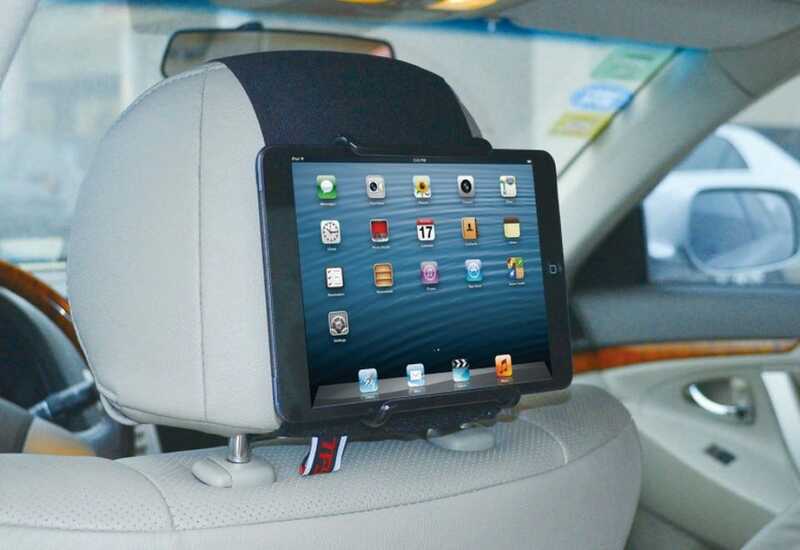 Whether you want to mount a tablet, a large phone, or even a Nintendo Switch in your car to keep your kids entertained on the road, these sturdy mounts will help you add in-car entertainment for dirt cheap. In the age of ubiquitous personal devices the premium options for built-in car entertainment (like the drop down DVD players of yesteryear and in-headrest screens) have largely gone the way of the VCR. 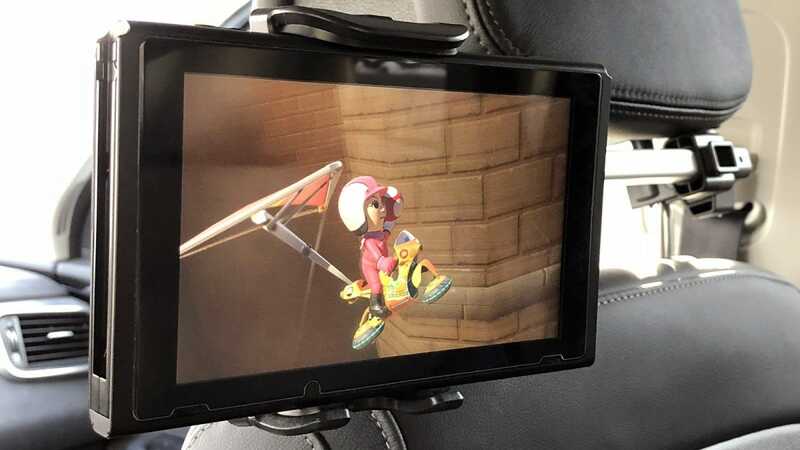 We pored over and tested various car mount designs in a quest for the perfect mount that would easily accommodate both a slender tablet (like an iPad Mini or Fire Tablet) as well as a thicker tablet-like device like the Nintendo Switch. Here were our basic criteria for selecting a good mount. Easy Installation and Removal: No adhesive, screws, bolts, or permanent changes to the vehicle are required. Sturdy Slip-Free Mount: The last thing any of us need is for an iPad or Switch to go skittering out of the mount and onto the grocery store parking lot. Mount Depth: Many products have very narrow connection points between the edge of the device and the mounting bracket. We only looked at mounts that had enough depth to hold everything from a slim tablet to a thicker device like the Switch. Articulation: The ability to rotating/tilt the device for optimum viewing angle is important and, with the exception of one of our suggested mounts, they all can be adjusted. 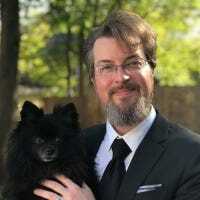 With those points in mind, here’s our top pick, as well as some backup suggestions for those of you who have special use cases and may require slightly different mount designs. The iKross mount ($19.99), seen holding the Nintedo Switch in the first image in this article and bare in the image directly above, is our favorite tablet/Switch mount. The design is very straight forward: you simply raise the headrest of one of the seats in the row ahead of the passengers who will be using the portable devices, clamp the two adjustable headrest clamps onto the metal bars of the head rest, and then attach the tablet clamp (which expands up and down, using spring tension to hold the tablet firmly). The tablet mount itself has a socket joint so it’s easy to pivot it around for the perfect viewing angle. You can attach the tablet mount to the end of the telescoping arm (as seen here) or you can slide the telescoping arm back into the body of the mount and switch the mounting plate from the end of the arm to the center of the mounting bar (which places the device in the center of the headrest). Not only is the great for times you only have one kid in the back and they want the screen directly in front of them, but if you’re on a particularly bumpy road and the arm is vibrating a little too much, you can move the the mount point to the center of the headrest to significantly decrease the vibrations. Over all the iKross mount was an absolute hit and the kids we tested it with found it easy to use, stable, and perfect for playing round after round of Mario Kart in the backseat. Further, because it can position the tablet both directly mounted to the headrest and offset in the center, it’s a far better value than buying a mount that can only do one or the other. The only (minor) complaint we can make against the iKross mount is that it would be really nice if, when the bar is full extended, you could attach the far end of the bar to the adjacent seat’s headrest for increased stability. The Weitus Headrest Mount ($15.99) isn’t quite as flexible as the iKross mount (you can’t switch between arm mounting and center-headrest mounting, for example) but it does allow for mounting the tablet or Switch in a centered and very stable position (and includes an additional mounting point for a smaller device like an iPhone) that braces the support bar between the two seats. This is a great solution for people looking for the most stable configuration to minimize vibration and screen bounce on bumpy roads. The downside to the configuration, however, is that both the driver and passenger seat need to stay in the same position—if you’re a family where one person drives and one person likes to recline and nap the trip away, we recommend sticking with a mounting solution that only attaches to one seat. Additionally, because the design is reliant on using two seats for support instead of one, you need to measure carefully to ensure your vehicle’s seats are the right distance apart (20.47″ to 27.95″ between the inner right and inner left headrest posts). 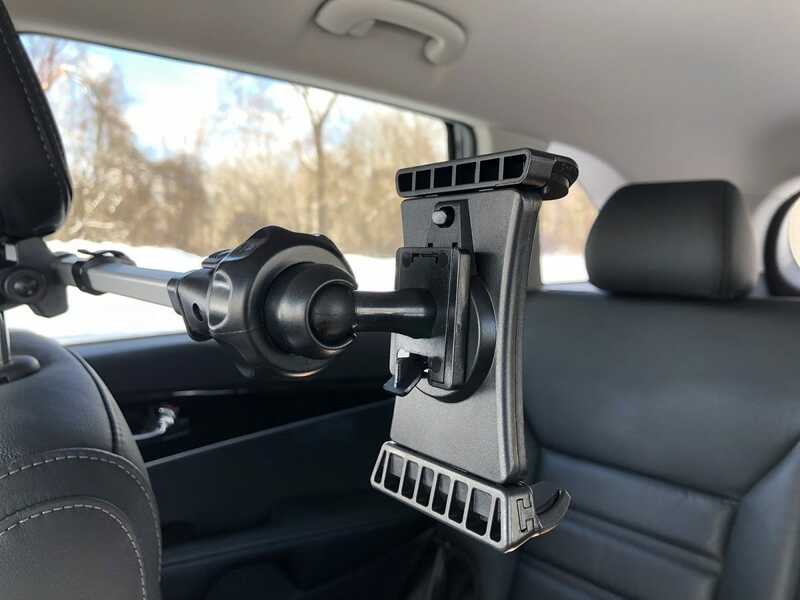 If you want to mount a tablet or tablet-like device on the headrest but you don’t want attach it to the headrest brackets (because, say, you’re very particular about where your headrest is positioned) then the TFY Universal Car Headrest Mount ($24.30) is a good choice. The mount has a deep bracket that can hold a variety of tablets and the Switch (although the relatively short Switch does cut it very close to the minimum height requirement for horizontal orientation) . It’s compact and easier to stow in a bag (if you wish to, say, take it for use in a rental car on vacation). The mounting point is higher up than many designs and that puts the tablet out of the reach of young children to avoid any accidental button pushes or excited kicking. On the down side, it offers no articulation at all (whatever angle it is at when firmly strapped to the particular style of headrest you have is the angle it will remain at) and there’s no ability to offset it or angle it towards other children in the back seat. That said, it’s a great fit for families with small kids and those that want to pack their tablet mount for trips.